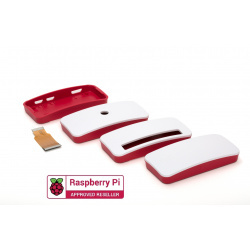 We're pleased to introduce our new range of professional, fully injection moulded Raspberry Pi Zero cases! Spice up your Flick Zero and Raspberry Pi Zero with a stylish white and orange Flick Zero case! RasPiBox Zero is an enclosure & PCB set for the Raspberry Pi Zero that includes an integrated prototyping PCB and DIN rail mountable case! Spice up your Flick Zero and Raspberry Pi Zero with a stylish white and orange Flick Zero case! This vibrant and durable case is made up of three parts; an orange base and a white two piece lid. This lid can be used in two different setups in either an open or closed position, allowing you to hide your Pi Zero and Flick Zero, or keep it visible to the world. Flick can work through materials such as acrylic, wood and glass so our plastic case (even when the lid is in the closed position) will not negatively impact any of the fun you can have with Flick! The Flick Zero case features two knockout holes which can be pushed out with a pen, allowing you to still access the GPIO with a short cable. Four suction cups come as standard. These can be installed on the bottom four corners of the case. The suction cups can be mounted on many different surfaces such as glass, plastic, or wood and still be removed easily. Perhaps you want to set up your Flick Zero & Raspberry Pi Zero to only allow entry through a door if you swipe the right pattern - with the Flick case, you could mount it right next to the door without the need to drill any holes or hammer any nails. Need help assembling your Flick Zero case with a Raspberry Pi Zero? Check out our quick start and FAQ page here that will guide you through the process of piecing it together. Visit our Flick GitHub page and acquire all the software you need to get up and running with your brand new Flick Zero and case. Only includes the case. RPi Zero is not included. Don't forget to remove the protective film from the acrylic. RasPiBox Zero is an enclosure & PCB set for the Raspberry Pi Zero that includes an integrated prototyping PCB and DIN rail mountable case! The PCB can be fitted with a voltage regulator kit (included), that be take a high voltage input (9 - 35V) and steps it down for use with the Raspberry Pi Zero. This kit includes voltage regulator parts.